Know what a mortgage backed security is? How about a collateralized debt obligation? Does the term subprime mortgage ring a bell? If you answered no to all of these questions, don’t fret because there’s a movie that provides all the answers, a cinematic “Wall Street Banking For Dummies,” if you will. That movie is “The Big Short,” a story about the 2008 housing bubble collapse and ensuing recession based on the book by Michael Lewis (author of the tomes that spawned critically acclaimed movies “The Blind Side,” and “Moneyball”) and directed by the last person you’d expect: Adam McKay. That’s right, the mind behind laugh-out-loud Will Ferrell comedies like the “Anchorman” movies, “Step Brothers,” “Talladega Nights” and “The Other Guys.” But don’t write him off as a one trick pony because McKay—with the help of an ensemble cast—creates a multi-layered film of imaginative flourishes that will make you laugh, cry and maybe learn a little something along the way. So what made this master of laughs pursue a movie about the sins of big money? “I’ve always been into politics and always sort of tracked corruption and after we made ‘The Other Guys’ I started researching the collapse because no one in the news was telling me what really happened … this is one of the biggest stories of the last hundred years,” McKay said during an interview after a screening of the film. He also described Lewis as “an incredibly amazing storyteller” whose work is “one of the great books of our time” and “the perfect blend of entertainment and tragedy.” He’s a fan of how Lewis writes about how powerful ideas can become. In a way, it’s the thinking man’s “Wolf of Wall Street.” Yes, the movie has naked women, but it’s more concerned about the esoteric Wall Street terminology and grievous mistakes and corruption that led the housing market to fail rather than the opulent lifestyle (cocaine, Quaaludes, prostitutes, the whole shebang, etc.) that they can provide. Sorry, Mr. Belfort. 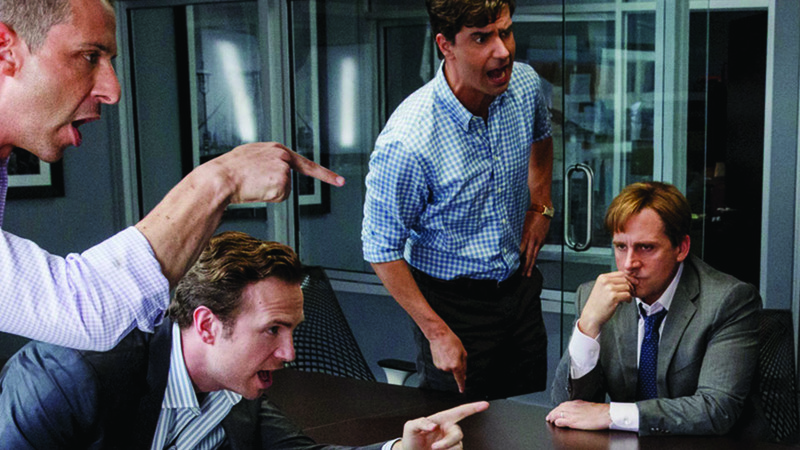 That’s not to say that “The Big Short” doesn’t have its Scorsese influences. Characters aren’t above breaking the fourth wall to explain things like the aforementioned CDOs for memorable and comedic moments. It’s got enough cutaways to satisfy an episode of “Family Guy.” But don’t call it a comedy. As McKay said, “It’s not a comedy in a traditional sense” so it doesn’t adhere to one genre. For instance, the film cuts away from the main story to allow well-known celebrities (including Margot Robbie, a “Wolf of Wall Street” alum) to make these boring financial terms actually seem interesting and relevant to the real world. Remember when you asked your math teacher that very question? Just let Anthony Bourdain and Selena Gomez take a moment of your time to shut you up for good. Unlike McKay’s other films, he used improv sparingly as a “spice” for scenes, instead sticking to the script. In terms of plot, the film follows several groups of people who realized that the housing market was backed by bad mortgage securities and decide to bet against the market—the American economy, mind you—by buying up tons of these mortgages and shorting them when the housing bubble bursts in 2008. Everyone else views the market as rock solid and believes them to be insane. They’re like Hoffman and Redford’s Woodward and Bernstein, stumbling upon a shocking conspiracy that goes all the way to the top. The best character by far, however, is Mark Baum, played by Steve Carell (who is at the top of his acting game). He’s an obnoxious hedge fund manager working under Morgan Stanley who, as a child, tried to find inconsistencies in the Talmud at Yeshiva. He’s also a broken person, reeling from a major personal loss that he masks behind his anger. It makes his performance all the more powerful and complex. McKay called him “tenacious” and compared the actor’s process to the method acting of Christian Bale, saying he’s never truly happy with a take. The director described the characters as “specific,” “broken,” “vulnerable,” yet “lovable,” and Baum is certainly a perfect example of those adjectives. Commenting on the amount of talent in the movie, McKay asserted that his entire dream cast said yes to join the project. “Never has that happened in the history of film,” he said with a laugh. Using a lot of shaky cam, close-ups, blurriness, jarring cuts and pictures from the years leading up to the collapse, the movie has a real-life documentary feel to it. The director says it was shot in “a human real, impressionistic way” to make Wall Street seem less far away to the audience. More importantly, McKay actually has the honesty to let us know when the film is taking creative license and emphasizing when events actually happened. All the while, it makes you wonder how much you underestimated the collapse, preaching about the brokenness of our banking system, the government agencies that are supposed to keep them in check, and even the shortcomings of capitalism itself. Bear Stearns, Credit Suisse, Deutsche Bank, Morgan Stanley and others aren’t exempt from the script’s critical wagging finger that says greed is most definitely not good. Sorry, Gordon Gecko. There’s a beating heart at the center of the plot that doesn’t over glorify what these people did, although they made billions. They’re quick to recognize that people lost their jobs, homes, pensions and social security in the aftermath of the bubble burst and a scene in the bare offices of a defunct Lehman Brothers helps to underscore this. At the end of the day, McKay hopes that audiences connect with his film and that it helps spark a dialogue among regular people about the blatant corruption and fraud that screwed our economy in the first place and continues to do so today.